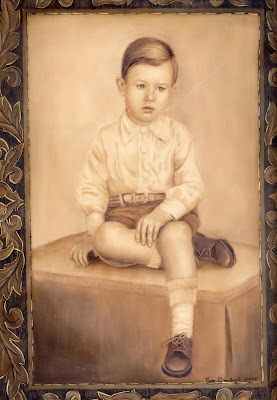 This is a painting I did from an old sepia photo of my father. He doesn't look like he likes being dressed up or sitting still. Dad is in his 80's and that is still the case! It is painted on a 10x14 porcelain tile including a painted mat with gold touches and framed. I will see if I can take a better photo to include the whole thing. I am glad to be home and itching to paint.